Most technical analysis of gold boils down to “what the charts tell us about gold’s next move”. The next move according to most seers of the trade – is “imminently bullish” and represents one, last chance for investors to save their financial souls. First, most services provided on a retail basis (newsletters with special bulletins, buy/sell recommendations, daily and weekly charts, etc.) are geared for traders, not investors. And most of the advice is short-term in nature. There is considerable lip service to the big picture, of course. But that is usually offered either to emphasize the immediacy of the prediction or justify why it is taking so long for the expected results to materialize. Second, advisors and their clients continue to view gold as an investment. Big problem. Gold is not an investment. It is money. And it is real money because it meets all three specific requirements of money – medium of exchange, measure of value, and store of value. Third, unrealistic expectations. Since gold is not an investment, it does not respond to any of the things that most people characterize as “drivers of the gold price” – political instability, social unrest, global wars, changes in interest rates, etc. Hence, the logically expected results don’t happen. The problem is not in the logic, but in the underlying premise. Actions taken in belief that gold is an investment will yield unexpected results. There are some who think they can predict the price of gold based on mathematical calculations of the extent to which the money supply has been inflated. But the effects of inflation are volatile and unpredictable. The price of gold is a reflection of changes in the purchasing power of the U.S. dollar. Since the U.S. dollar is continually losing value over time, this results in a gold price which is continually higher over time. The specific results of the inflation are impossible to predict. Nowhere has analysis of gold become more of a joke than in attempts to infer correlation (conversely or inversely) between gold and something else. Nay, anything else. It has reached a point that if we hear any news of a negative nature, it is assumed that gold will benefit, i.e., its price will move higher. Common themes involve the economy, the stock market, interest rates, trade wars, other countries’ financial problems, social unrest, etc. Most people don’t understand these topics on their own, let alone, when gold is added to the mix. For example, what is the relationship between the economy and the stock market? Does a weak economy translate to a falling stock market? Are lower interest rates conducive to economic activity? Are rising interest rates today a sign of inflation? In the rush to explain gold’s price action, reporters and analysts continue to confuse and complicate. The lack of knowledge regarding gold leads to answers and explanations for price action that are illogical and incorrect. Another factor is that the explanations are headline driven. Huh?! Is an explanation/refutation even necessary? Just “ignore” the article and move on. ‘All’ Signs? 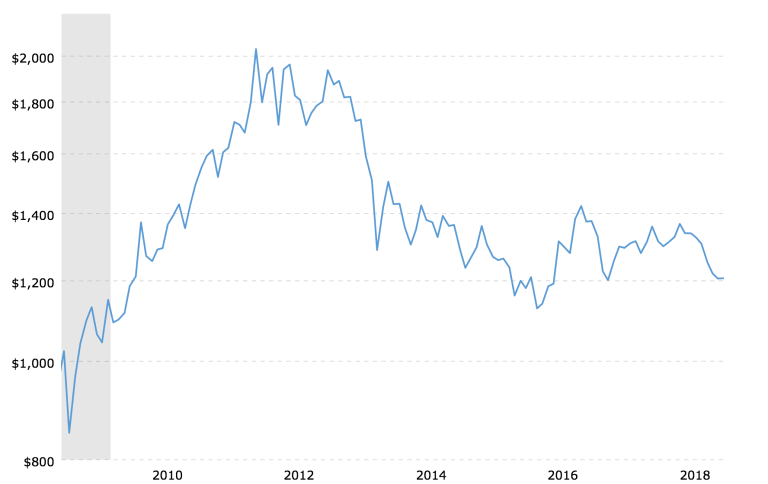 Below is a chart of gold prices for the past ten years. It may or may not be a sign, but it doesn’t appear that the price action of gold supports the claim. And, if it were true that gold prices are headed higher, there is only one ‘sign’ that will tell us whether or not we are correct. Higher gold prices translate to a weaker dollar. 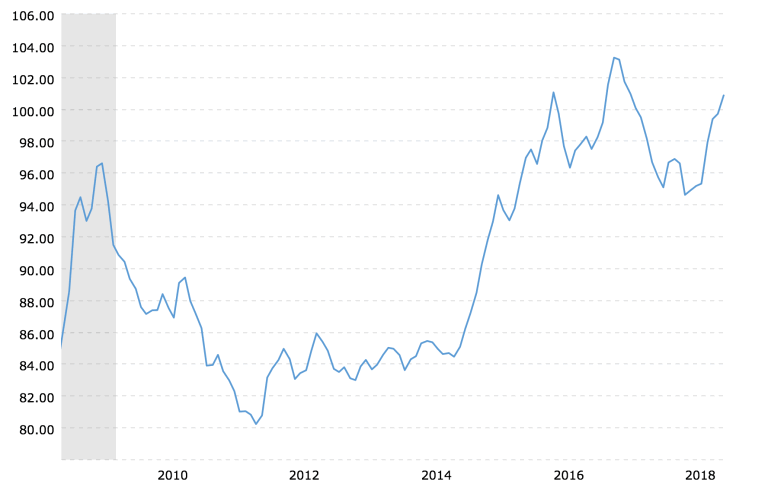 Here is a chart of the U.S. dollar index over the past ten years. Draw your own conclusions. If you are acting on advice from others about gold, you may want to reexamine their claims and results.